Picture yourself sitting on your patio or deck on a warm spring day, cool drink in hand and a comfy cushion against your back. It’s a lovely thought – with the birds singing and the flowers blooming, a patio or deck is the perfect way to watch the world come alive again after a long, cold winter. But being surrounded by beautiful scenery isn’t enough – you could also make some additions to your patio or deck to make it a little slice of paradise in your own backyard. Let some sun into your home with a new glass sliding door. A lot of homeowners appreciate their sliding doors because of the amount of light they let into their home and because of the ease with which you can access the outdoors. Especially if you are hosting a barbeque, sliding patio doors are the perfect way to get food, drinks, and tableware out onto your deck quickly and without hassle. So don’t be shy and slide on in for a patio door installation with your local window and door specialists. Purchasing outdoor furniture is a great way to add style and comfort to your patio or deck space. Most outdoor patio furniture is made of durable materials such as teak, eucalyptus, and cedar wood; synthetics like plastic, ABS, and synthetic resin wicker; and metals like aluminum, steel, and wrought iron. Made for the outdoors and for your comfort, there is a range of styles and options to choose from that will bring your patio or deck from drab to fab. 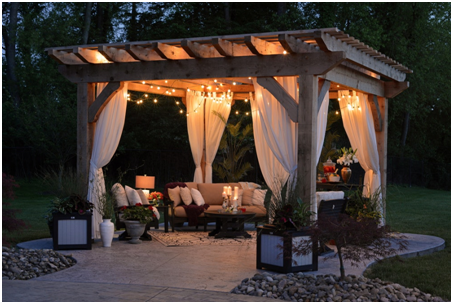 Adding lighting options to your outdoor space is just as important as furnishing it. As the sun sets and the barbeque begins to fizzle, you’ll want to make sure that there is enough light around to maintain a cozy outdoor ambiance. Too much light can be detrimental to the feel of your deck or patio space, so consider using overhead lighting to add just the right amount of light to the surrounding area. String lighting is a popular choice because they resemble pretty little stars and are not overbearing with the amount of light they produce. Another great addition to the backyard can be some new cooking appliances! While this idea is bit outside of the focus of the article, it didn’t make the ‘official’ list but felt it was worth pointing out. For many back yard BBQ enthusiasts, getting a smoker has been on the list but some people feel intimidated by a new product they’ve never used before. Fear not as electric smokers are great options for beginners. If you’ve been thinking about it and are redoing your backyard, then you should consider getting a new electric smoker this year! With the essentials out of the way, consider adding a few finishing touches. Colour is a key component, so don’t be afraid to add some pillows that pop or plant some vibrant flowers in pots or hanging baskets. Make the space your own so that you can enjoy it throughout the spring and summer months.